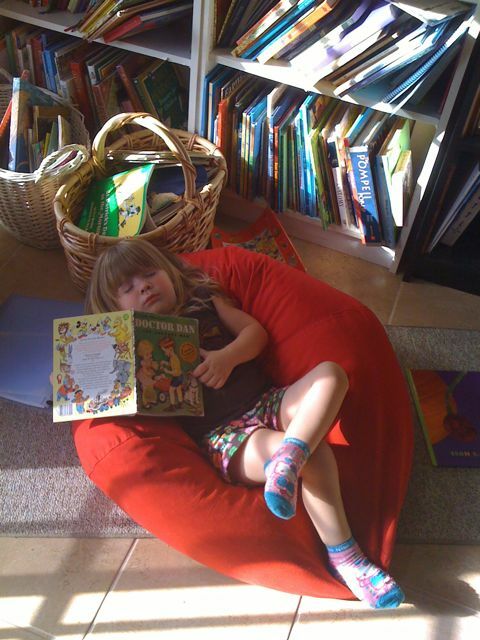 Yesterday, I shared this picture of Lydia sacked out in front of one of our many bookshelves. She stopped napping regularly long ago, but every once in a while a nap sneaks up on her. She slept for almost 2 hours in the same spot - oblivious to the boys coming in and out the door to the left of her, various conversations, and the noise of making dinner. She obviously needed the rest. Have you seen this study? Apparently they have found that the more books a family has in their home, the more education the children in the home pursue. On average, kids that grow up in houses full of books pursue 3 more years of schooling on average than kids who grow up in homes devoid of books. I think our kids have a pretty good head start. Bring on the MAs, the PhDs, JDs, MDs, etc. That pictures was all kinds of cute. It definitely seems that the kind of books people have around says a lot about them and their values. Not surprising at all that owning good types of books (and library usage) would suggest kids finishing college or pursuing advanced degrees. That picture was all kinds of cute. 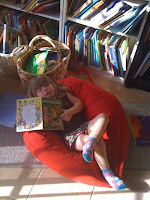 With as many books as we have around the house, my kiddo should be good to go. lol!